Protein benefits your body in so many ways that it's nearly always a good idea to add more to your diet. If you lift weights, increased protein can help you build muscle, and if your goal is weight loss, a higher intake of protein can make you feel more satisfied, so you eat less. However, a high-protein diet is not without its drawbacks — one of which is the potential for constipation. Read more: Do Protein Shakes Cause Constipation? General recommendations are that protein should comprise between 10 to 35 percent of total calories. The other two macronutrients, carbohydrates and fats, should make up 45 to 65 percent and 20 to 35 percent of total calories, respectively. This breakdown is designed to allow you to get enough of the specific nutrients that each macro contributes to your diet. One important contribution is dietary fiber, a type of carbohydrate that comes from plant cell walls. The body can't digest fiber, so it moves through your digestive system mostly intact. It helps add bulk to stools so they pass more easily, and it absorbs water to keep stools soft. The daily recommended intake of fiber for men is 38 grams, and for women it's 25 grams. 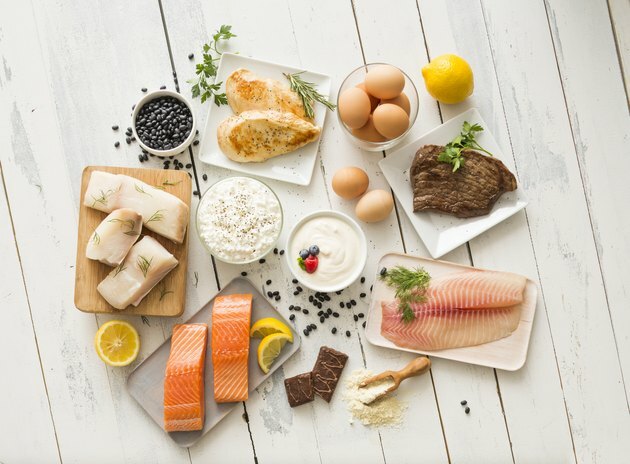 When you increase your protein intake, you naturally have to lower your intake of either fats or carbohydrates — or both — so you don't go over your daily calorie needs. Cutting carbs often means cutting fiber, which can lead to constipation. When you're constipated, you may only pass stools a couple of times a week, and they may be hard, dry or lumpy. Dehydration is another risk of high-protein diets, and it's one of the most common causes of chronic constipation. Your kidneys have to work harder to rid the body of waste products from protein digestion, and they rely on water to do their job efficiently. Combined with low fiber intake, this can cause a noticeable change in your bowel habits. There's help for problematic high-protein-diet bowel movements. First, make sure you're including enough carbohydrates in your diet so that it's possible to get the daily fiber you need. Carbohydrates are your body's main source of energy, so it's not only important to get enough fiber for healthy digestion, but also to maintain adequate energy levels. Changing the carbohydrates you eat can also help you get more fiber while keeping your carb intake low. Nonstarchy vegetables, such as spinach, broccoli, bell peppers and cauliflower, are low in carbs and high in fiber. Low-carbohydrate fruits, such as berries, are also rich in fiber. Whole grains are higher in carbs but are a good source of fiber and essential vitamins and minerals. Avoid refined and processed carbohydrates from white bread, pasta and rice; fast food; store-bought baked goods; and chips and other snack foods. These foods are low in fiber and other nutrients. On a high-protein diet, you need to drink more fluids. How much you need depends on your weight, gender, activity level, the climate in which you live and how high in protein your diet is. General recommendations for people eating a normal diet are 11 1/2 cups of fluids per day for women and 15 1/2 cups a day for men. Use this as your baseline and work on increasing your fluid intake more each day. Add fluids appropriately if you weigh more, live in a warm climate or are very active.